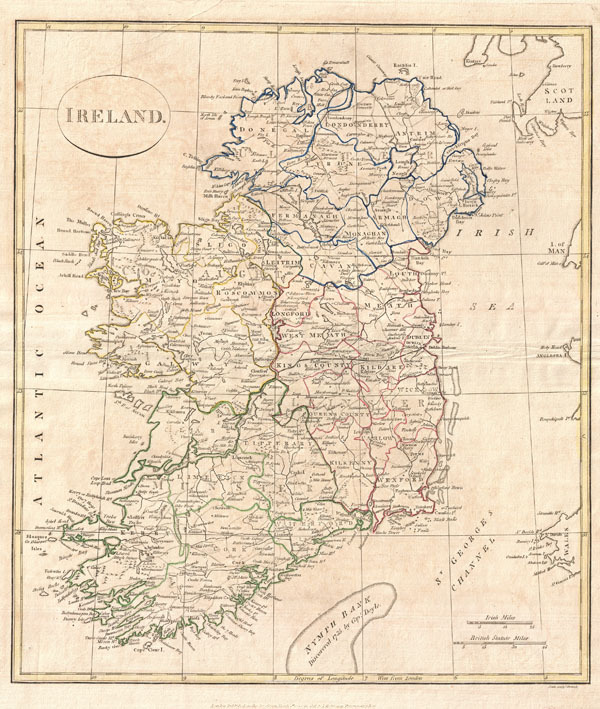 A fine 1799 map of Ireland by the English map publisher Clement Cruttwell. Map shows Ireland's four provinces, which remain the same to this day. In the north is Ulster, Connaught in the west, Leinster in the east, and Munster in the south. Leinster is comprised of Carlow, Dublin, Kildare, Kilkenny, Laois, Longford, Louth, Meath, Offaly, Westmeath, Wexford and Wicklow. Munster is made up of Clare, Cork, Kerry, Limerick, Tipperary and Waterford. In Connaught are Galway, Leitrim, Mayo, Roscommon and Sligo. Antrim, Armagh, Down, Fermanagh, Londonderry, Tyrone, Cavan, Donegal, and Monaghan make up Ulster. The map also shows some major roads, river ways, mountains and other topographical features. Off the coast, Cruttwell makes note of various shoals and, just south of the island, the Nymph Bank, discovered in 1735 by Captain Doyle. Features two units of measurement in the lower-right quadrant: Irish Miles and British Statute Miles. Outline color and fine copper plate engraving in the minimalist English style prevalent in the late 18th and early 19th centuries. Drawn by G. G. and J. Robinson of Paternoster Row, London, for Clement Cruttwell's 1799 Atlas to Cruttwell's Gazetteer.